As I tip the taxi driver and heave my hand luggage to the sidewalk, I look up at the square blocky building that is the Malta International Airport. It is not a large building, and yet, its clean lines and practical structure points towards its functional and efficient intent. As I walk beyond the sliding doors, I am greeted by a number of compact shops; a bookshop, a small cafeteria, a pharmacy, and even a bank branch. All offering purchases and services which might be useful to the unwary traveler. I am aware that liquids cannot be taken beyond the checking-in point and upstairs, however since there are even more fully-equipped stores on the higher level of the complex, which the traveler has to traverse in order to wait for his airplane at the appropriate gate, I am not at all worried. I know that all my needs will be amply met. Malta International Airport, situated in the town of Luqa, is the only working airport within the Islands of Malta. It is usually referred to as ‘Luqa Airport’, and is located around 5km away from the capital city of Valletta. Although the first civil airfields in Malta were constructed at Ta’ Qali and Ħal Far, these were severely damaged during the Second World War. The first airfield terminal in Luqa was financed by the British government (since at the time Malta was under British governance) in 1956. Later, in 1987, the Maltese government started constructing a new air terminal, as well as managing a total refurbishment of the Airport. Arrivals and Departures Lounges, as well as a VIP area, were added, as well as new upgraded facilities which included air conditioning, computerized check-in desks, retail outlets and a larger duty-free area. The completed present airport became fully operational in 1992. Over the last twenty-five years, passenger numbers have been continually on the increase, not only due to shifts in trends, globalization and the entry of Malta into the European Union, but also due to the introduction of a number of new routes served by low-cost airlines, such as Ryanair and Easyjet, apart from the service of Airmalta, which is Malta’s official airline, and which has been operating since 1973. Apart from being a dynamic and vibrant center of activity, the Malta International Airport is also used as a cultural hub, since its premises are commonly also used to host temporary exhibitions related to a number of art-related projects, featuring paintings, sculptures, and even media-related projects done by various artists. This not only creates an opportunity for artists to showcase their talent, but also introduces newly arrived tourists to Maltese art. In April 2017, the Malta Airport Foundation added a dash of color to the journey of those travelers who passed through the Malta International Airport, by creating an exhibition featuring twenty local pieces of art. Over the next few months, further exhibitions will adorn the airport, ranging from graphic design, to photography and paintings featuring iconic spots around the Islands of Malta, as well as slices of everyday life in Maltese towns and villages. This article was written by me and published on the online magazine LivingInMalta. To access the original, please go here. Built between the 16th and 18th century in the Mannerist style by the architect Gilormu Cassar, this served as the main palace for the Grandmaster of the Order of the Knights of Saint John, who at the time governed the island. There are two main entrances to the Palace, one found on Old Theater Street, and the other on Merchant’s Street. 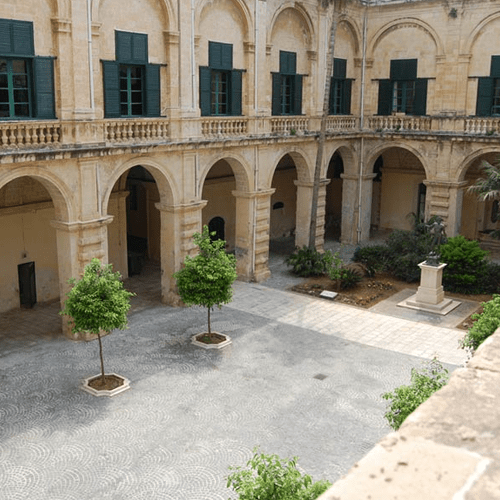 It currently houses the Office of the President of Malta, The Palace State rooms and the Palace Armory are run by Heritage Malta and open to the public. To note are also the famous Tapestry Hall, the State Dining Hall and the Ambassador’s Room. Situated in Fort St. Elmo, the National War Museum is one of the most popular museums on the island. It hosts exhibits relating to Malta’s military history ranging from the Bronze Age to present times, however is mostly features artillery pertaining to World War I and World War II. The building housing the Museum was originally a gunpowder magazine, which was converted into an armory in the 19th century. Anti-aircraft gun crews were trained there during World War II.